TFW2005 content contributor Ktulu recently had a chance to sit down with Tara Strong, the voice of Sari in Transformers: Animated. Check out what she had to say below! TFW2005: Though you’re a long accomplished voice actress, the Transformers fanbase is of course getting to know your work even better now with your character Sari on the new Transformers Animated series. Prior to this show, did you know much about or have any interest in the Transformers franchise? Tara: When I was younger, I loved the Transformers. Always had a few toys that I couldn’t figure out! TFW2005: What initially drew you to the Transformers Animated series, and once cast, how easily did you find yourself immersed into your character and the storyline? Tara: I auditioned for the show hoping I would get the part. For starters, Sari was the ONLY regular girl role up for grabs! Plus, the Transformers is such a special franchise and I feel honored to now be a part of its history. It was easy to immerse myself into the character because the writing is so good. TFW2005: Voice director Susan Blu has a long standing history with Transformers. How beneficial was her experience with the franchise to achieving the best tone for the performances? Tara: She’s the greatest, no matter what she does. Her history with the show made it fun and interesting. TFW2005: What inspiration have you drawn upon for your portrayal of Sari? Tara: I’m inspired by her character design, backstory, and the passion of the creators. I just try my best to bring their vision to life. TFW2005: How much has your experience with previous roles affected how you approach new characters? For example, how much of Bubbles is in Sari? Tara: There is no Bubbles in Sari, I try never to repeat vocal qualities or inflections. Each character has its own life in my head. TFW2005: Is there any insight you could give us on where Sari’s adventures with the Transformers might take her throughout the rest of the series without giving too much away? Tara: Let’s just say her entire identity could be a surprise. TFW2005: The rest of the Animated cast is full of many other fan favorite voice actors as well, such as Corey Burton and David Kaye. Does the strength of your fellow cast mates, on this or any show, reinforce your intent to give all you can to the performance? Tara: I always try to give my all. I have to say, this cast is stellar. The room is so full of legendary talent it’s breathtaking. It’s the first time I’ve met David Kaye because he was previously in Vancouver and I was instantly smitten with his talent and charm. We’ve become very close friends. My hubby, a realtor, took extra special care of his family and got them settled in a wonderful new home here. TFW2005: What would you say has been your favorite voice acting experience thus far, and conversely, your worst? Tara: I have so many favorites, I’ve been extremely lucky. I especially loved doing the Little Mermaid II, Powerpuff Girls, Teen Titans, and of course I love Transformers … too many to choose! TFW2005: Which of your characters have been favorites of your children? Tara: My kids love Timmy on The Fairly OddParents and currently they’re CRAZY for Truffles on Chowder. TFW2005: Do you look for any specific key elements of a character or story when choosing roles? Tara: I don’t really choose roles, they choose me. When I’m at an audition, something organic will happen at the audition and if it’s meant to be, it just sort of magically evolves into a living entity. TFW2005: Having grown up idolizing shows with veteran voice actors the likes of Peter Cullen and Frank Welker, many Transformer fans have developed a keen interest in voice acting themselves, and many perform in Transformer fan projects. What advice do you have for those of us seriously pursuing a voice acting career? I realize this is a common question, but your opinion on the matter would be much appreciated. Tara: Take acting classes, singing lessons, voice-classes where there is actual studio time. There are wonderful classes in Los Angeles, but I can’t recommend outside this state. If it’s in your heart, keep at it, make a reel and send it off to local reputable agents … and of course check out http://www.voicestarz.com! TFW2005: Do you know of any newer voice actors that used the Voicestarz program to help them get started? Tara: We had one girl signed by William Morris & CESD. TFW2005: Finally, what sort of series are you most looking forward to being a part of next? Are there any specific shows or game projects you’re already cast in that you’re particularly looking forward to? Tara: I hope Transformers gets a pick up…keep watching Chowder, and we’re working on a whole new season of The Fairy OddParents. TFW2005: Thank you again for your time Ms. Strong. We’re not only Transformer fans here at TFW2005, but fans of great animation in general, and many of us have strong interest in video games as well. You’ve been part of many of our favorite shows and games so this has been quite a privilege. Thank you! Tara: My pleasure. Thanks for watching and be sure to check out my website at: http://www.tarastrong.com! I think she does the voice of Ben Tennyson too right? My sons and I met her at FX in Orlando in January, as we are all fans of shows she does voices for (my older one wore his Ben 10 shirt to the show). Interestingly, her 'Tara' voice doesn't sound like most of the characters she voices – both of my sons dropped jaws when she rolled out a few sentences as Timmy Turner. And yes, she is rather attractive. But hey, didn't know she was Seth in Lost Odyssey. Working through that game now. She's seems really down to earth, and the fact that she was considerate enough to conduct the interview with TWF2005, AND likes Transformers, just makes me like her even more than I did before. The only thing I don't like about her is that she isn't single. I don't think Sari is a robot considering how she did'nt fall under Soundwaves command in the recent Sound and Fury episode. She also had have her hand bandaged up after going fist to fist with Bulkhead. If she was a robot, she must have a spark in order to have such a "human" character and not that of a mindless machine. A spark doesn't go unnoticed around a bunch of Autobots..
EDIT: Btw that voice actress is hawt. Tara Strong really did a great job with making Sari a not so annoying, and instead quite likable, human character. She has done so many cartoon voices and i often don't recognise her voice in each of her different characters without looking at the ending credits! Now that's great voice acting talent! 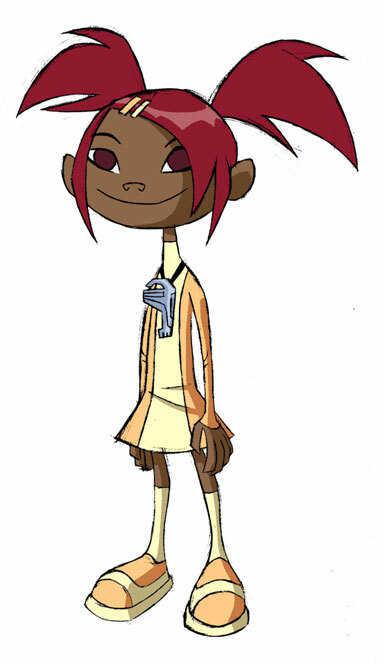 I think she does the voice of Ben Tennyson too right? And Omi from Xiaolin Showdown? If so, she does really good boy voices too! Unreal to see the amount of work that she has done. I would have never know that she was the voice of timmy turner and sari. So on the "What is Sari?"? front. Why hasn't anyone suggested that Sumdac built Sari useing tech gleened from Megatron. she's a baby Megatron. Also, Sumdac is Cadmus spelled backwards. From wikipedia "Nevertheless, Cadmus was deeply troubled by the ill-fortune which clung to him as a result of his having killed the sacred dragon, and one day he remarked that if the gods were so enamoured of the life of a serpent, he might as well wish that life for himself. Immediately he began to grow scales and change in form. Harmonia, seeing the transformation, thereupon begged the gods to share her husband's fate, and she did (Hyginus)." A transformation perhaps? Wow, I must say – TFW has gotten a LOT of exclusive interviews lately. They're not easy to get, most people don't answer back! Makes the ones that do respond that much more appreciated though. Nice interview. I really like what she has done with the character. I hated the human kids in A/E/C, but she really does a great job with Sari! tara strong has got it going on. I really don't care about Sari, but she is a cartoon character. I could care about Tara though…I could care about her a LOT. I can see it now.. Sari's father is in fact Dr. Light and her real name is Roll. If Dr. Archevil shows up I bet he'll be like Dr. Wily, creating evil humanoid (cannon fodder) robots for the Autobots to destro– Hey wait a minute.. Seriously, it raises the question: Where is Sari's mother? I doubt she's a robot.. The Episode "Along Came a Spider" clearly shows her skin getting old, in that one particular scene, pretty much confirming she is in fact human. Don't think you have to be a fanboy to think she's hot. I think anyone who thought she was attractive, fanboy or not, would say so. Was this interview conducted in person? Wouldnt be interesting Tara Strong played a voice character in the Transformer 2 movie as Arcee. Dont get me wrong I still like the original voice actress Susan Blu, but it would be cool for a passing of the torch.